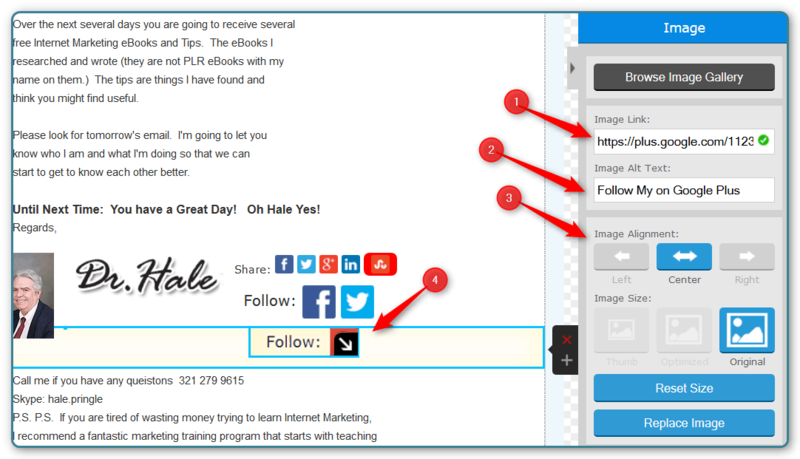 Adding a Google Plus Follow Me Button to AWeber emails can be very important if G+ is your Social Media Platform of choice. Unfortunately, AWeber does not have a link to add a Google Plus Follow Me Button to AWeber Emails. They have G+ in their list of Share Buttons, but not in the Follow Me buttons. In this post, I’ll show your one way to fix that. Most marketer’s today seem to gravitate to VERY dry plain text emails. They use compelling headlines, short lines, lots of white space, plenty of sub-headers and other copywriting skill, they just don’t spruce up the background around the main message. Since we are trying to brand ourselves, this seems like a real opportunity wasted. I talk in my new eBook AWeber Unleashed about how to put a header, your image, a signature block and Social Media buttons into AWeber. Even more importantly, you can save a basic framework as a template and the next time you start an email you have the header, etc. ready to go. 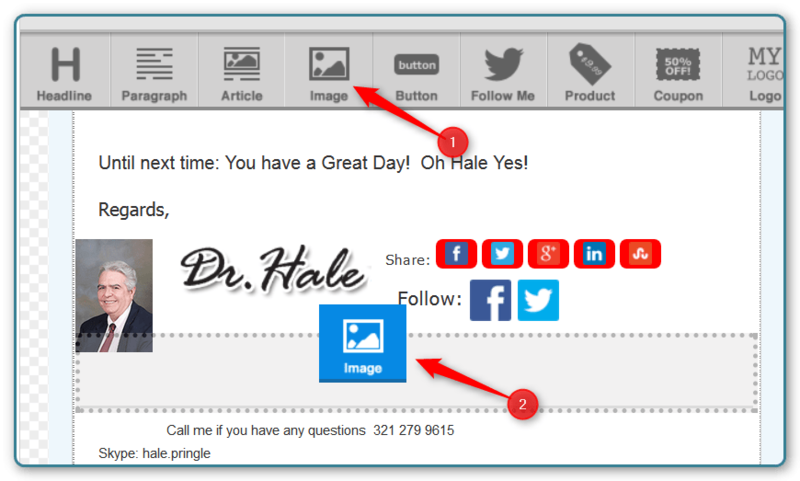 AWeber has an icon that you can drag down into your message called “SHARE.” This widget lets you indicate which of several Social Media sites you wish to allow your readers to share your email on. Here is the SHARE icon. #1 Shows the icon in its original position. You drag this down and it ends up looking like #2. #2 SHARE widget after you have placed it in your email. You can see that the G+ Share button is right in the middle of the clickable buttons. There is also a FOLLOW ME icon that you can drag down. #1 Shows the Follow Me Icon before it is dragged into the message. Okay, let’s fix that. I am giving you a Google Plus image that also has the word “Follow:” as part of the image. The FOLLOW ME widget is centered and won’t let us add another icon ro the right. So we have to add it below. I copied the word “Follow” and added it to the G+ icon. That way the font is exactly the same and the word won’t float away from the icon. First, we need to drag an image icon down into our text area. We will upload our G+ image into this location. Note that the Image will go in its own box below the Follow Me widget that is already there. Now upload the G+ image you downloaded above. Open Google Plus and click on your profile. You will see a long number in the Address Bar. Copy the whole link, starting with “https”. #1 This is where you paste the Google Plus URL with your long number code in it. #2 Put in an ALT Text value. Something that will tell what the image is to the blind readers and people who have images turned off. #3 The image is probably going to need to be centered. You can adjust this if you want a different look and feel on your emails. #4 You need to click on the image and drag the corner up to resize the image. It should be 139 px wide and 36 px high. Since you can’t see the size numbers for this small image you will have to approximate. Try to get the two copies of the word “Follow:” to match. The next time you start an eMail click on “TEMPLATES” –> “MY TEMPLATES”. Choose the one you want and click “APPLY”. You are ready to go with all the heavy lifting already done! I found your weblog web site on google and verify a number of of your early posts. Continue to keep up the excellent operate. I simply additional up your RSS feed to my MSN Information Reader. In search of ahead to reading more from you in a while! ?